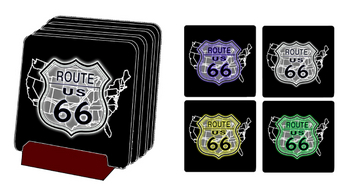 a 4 piece coaster set featuring the route 66 shield in 4 different colors. Each coaster has a cork back and the set comes with a cherry wood stand for displaying them. The coasters measure 3-3/4"x3-3/4" each.